Wow. 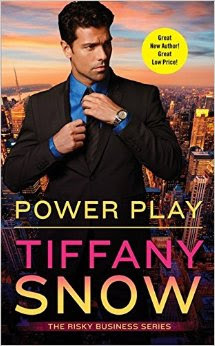 POWER PLAY is THE BEST “love triangle” book I’ve ever read. I generally really dislike books that contain love triangles and honestly avoid them, but POWER PLAY sounded so good that I had to give it a shot. And man, am I glad that I did! Sage Reese is an assistant for the hot, alpha, businessman Parker Anderson. She loves her job and her boss even though he’s extremely demanding of her time. When a sketchy account from the Russian Mob brings hot detective Dean Ryker into the picture she’s torn between two very different men; one that’s calm and collected and hasn’t shown her any bit of interest unless it benefits him, and one that’s open about his intentions and his interest in her. Will she choose the guy she’s been secretly crushing on since she’s began working for him? Or will she choose the hot, Harley driving, smooth talking detective? Now I obviously don’t know the final outcome of the series because POWER PLAY is only book one, but lets just say that I am very happy right now. I honestly loved both guys. I did like one a little more than the other, but I was rooting for them both. But I want to talk about the heroine, Sage (I LOVE her name by the way). She really surprised me. Generally when I read books where the heroine is torn between two guys, I really start to hate her. The whole leading two guys on at once thing starts to bother me, but Sage was actually pretty awesome. She was strong willed and humorous. Several times I found myself laughing out loud at some of her actions and words. Tiffany Snow, in my opinion, wrote the perfect story. Angst, love, hate, danger and a dash of humor, all interwoven in a beautiful story about figuring out what the heart really wants. I am SO excited to read the next book, PLAYING DIRTY. Once again I want to stress that I really, really dislike books with love triangles. So those people that are in my “love triangle haters club” need to pick up this book. You won’t be disappointed.